Lil Mama, Jay-Z and Alicia Keys sport attitude during their performance at the VMAs. Kanye West's infamous interruption of Taylor Swift's acceptance speech wasn't the only unplanned stage-hopping incident at the 2009 MTV Video Music Awards. 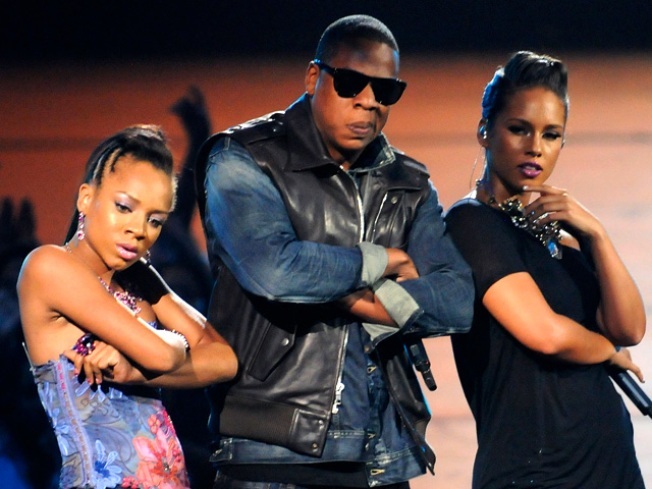 Somehow, rapper Lil Mama ended up on stage with Jay-Z and Alicia Keys during their performance of Hov's "Empire State of Mind" – and the hip-hop mogul, whose "The Blueprint 3" is the top-selling album in the country for a second week running – doesn't approve. "To interrupt that moment for us, I don't think that was the right thing to do," Jay said on Angie Martinez's Hot 97 radio show in New York City on Wednesday. "It was a lot of planning that went into that performance. To disrupt that was outta line." But now, he admitted, there isn't much to be done about the incident. "What I'mma do, fight Lil Mama?" he asked. For her part, Alicia wasn't happy about the interruption, either. "We can appreciate her being overwhelmed and inspired," Alicia Keys previously told NBC's "Today" show. "But we would have appreciated it if she would have did it from her seat." VIEW THE PHOTOS: Hottest Hip-Hop Stars! Lil Mama defended herself to MTV News after the ceremony, explaining, "I started to feel him and I just felt the energy." PLAY IT NOW: Did Kanye Get An Invite To The Emmys?